You can purchase Holman Pottery by placing an order, visiting our studio and gallery or from one of the galleries around the country that carry our work. If you are looking for a gallery in your area that carries our work, send us an email. Please allow 6 to 8 weeks for delivery of an order. Because Holman Pottery is hand crafted no two are exactly alike. 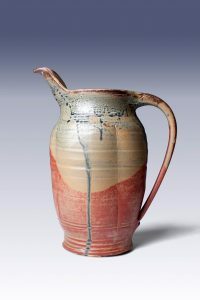 Therefore the variations of color, texture, and shape lend to the artistic nature of this pottery and should by no means be considered defective. Most shipping can occur within 4 to 8 weeks within the contiguous United States. All orders will be shipped ASAP unless a ship date is requested. Though we always try to honor a requested shipping date, we cannot guarantee it. Products are generally made to order so delivery time will vary. All shipments are via UPS Standard Service unless arrangements are made for other shipping methods. Should breakage occur during shipping, Holman Pottery must be notified immediately. All merchandise must remain in original packing material. All claims must be reported within 5 days of receipt. All returns must be authorized. Unauthorized returns will be refused. Holman Pottery sells wholesale to bona-fide galleries and dealers. Please contact Debbie Holman at info@holmanpottery.com for futher information.